« Porchetta + Manischewitz = WHAT? Toasted sesame fried rice, gay ice cream, and soup! I know what you’re thinking: that sounds amazing. This is one of those times you hope to get away with a “kitchen sink” meal – a little of this, a little of that, just enough inventiveness that it might work. I think it did. Bonus: this is practically a one-pot meal. This is not meant to be a recipe to follow precisely, but rather an approach to a quick, tasty meal using what you already have on hand. You can substitute any number of the ingredients below for what’s in your fridge. I toasted 1 tbsp of sesame seeds in a small skillet over medium heat, then removed from heat and set aside. In a large skillet I warmed 1-2 tbsp olive oil then added the white stems of thoroughly washed ramps, sautéing for about five minutes. To this I added small florets of broccoli and cooked, uncovered, adding small amounts of water to steam and cook the broccoli. At this point you could add a handful of marinated tofu, cut into small cubes (mine was marinated in sesame oil, red pepper flakes, lime juice, garlic, and soy sauce). I know tofu turns some people off so don’t bother with it if you don’t like it. Once nicely browned I added 1 tbsp fresh lime juice and 1 tsp lime zest to the mixture, and additional red pepper flakes, salt, and pepper, to taste. Since I had this gorgeous Niman Ranch ham on hand I cut a piece of it into small cubes and added it to the pan, just to reheat. 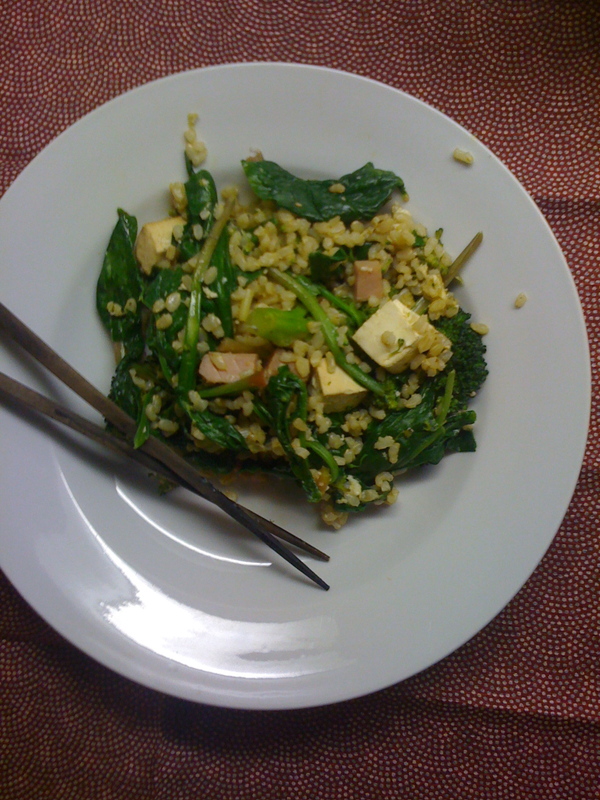 Then in went the cooked brown rice, turning up the heat to get a nice crust on the rice, leaving the pan uncovered, followed by a large handful of spinach, chopped, and the ramp leaves, cut crosswise in thirds, just to wilt, about 1-2 minutes. At the last minute I cracked an egg over the dish, turned off the heat, and mixed all together, using the egg as a sauce. Top with the toasted sesame seeds and serve. 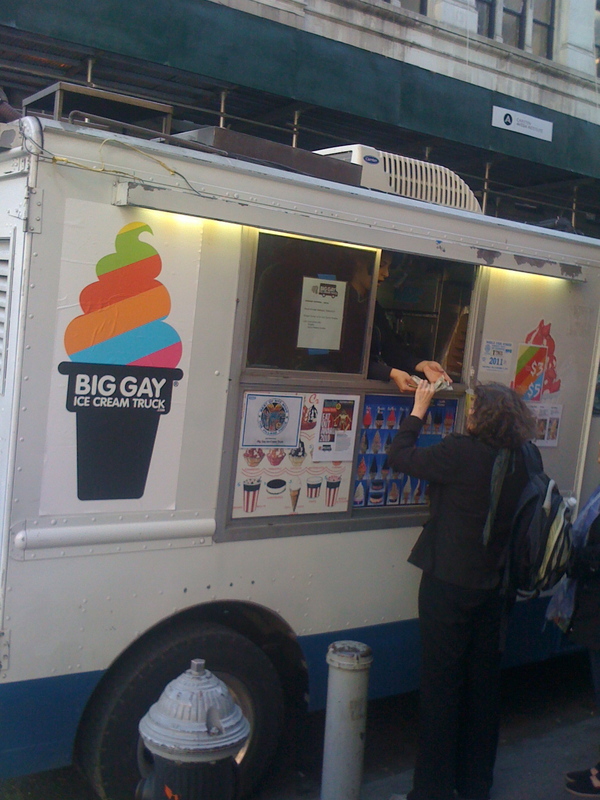 For kicks I’m sharing some photos from around Union Square today: the Big Gay Ice Cream Truck! I would’ve stopped for a cone but the line was down the block. Has anyone tried it? 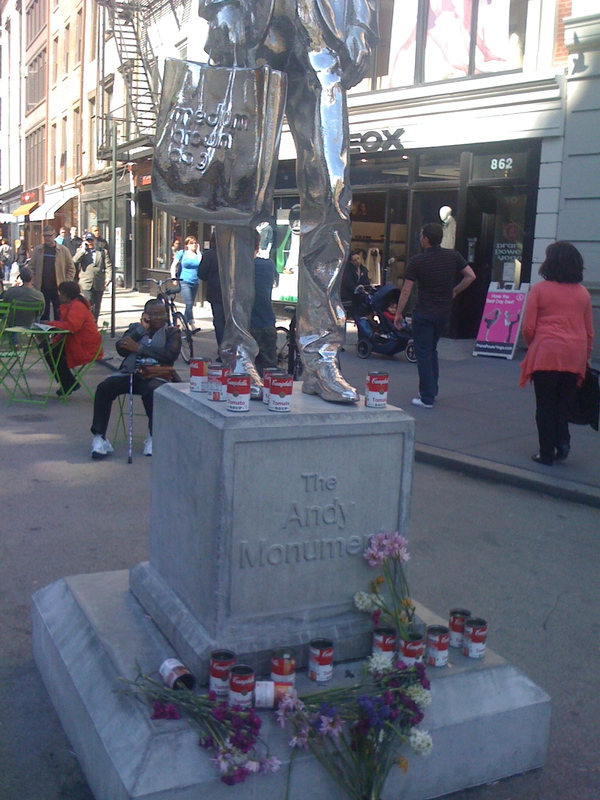 And the Andy Warhol statue by Rob Pruitt, which I was delighted to discover had been appropriately adorned with…Campbell’s soup cans. Wish I’d thought of that.